This paper deals with the investigation of the influence of various external factors (longtime exploitation; friction; corrosion) on Fe alloys water pipes mechanical properties studied by the microindentation method along with acoustic emission one. It has been shown that long-time exploitation (as well as aging) don’t practically change such characteristics as hardness and brittleness. The fine polishing has a very small influence, while coarse grinding slightly increases these parameters. The most effect of brittleness increase has been observed for the water pipes subjected to corrosion. It is well known that iron is one of the leading materials in the modern industry. The iron alloys account nearly for 90 % of the total metallic production. Such a large application of these materials is stipulated by their optimal exploitation properties: high values of strength and fracture stability in combination with the reasonably good ductility and flexibility. However the influence of various external factors can lead to the essential and undesirable changing of these properties during the prolonged exploitation of metals. One of such negative factors is the influence of corrosion agents (water, carbon dioxide, oxygen steam, etc.) resulting in the goods damage and considerable diminution of their useful life. Therefore a further investigation of the reasons adversely affecting the strength properties of iron and its alloys is of a constant interest. A non-destructive testing method, the microindentation along with the registration of acoustic emission (AE) signals, appearing under the concentrated load action, has been used in this work. The variation of the mechanical properties (microhardness and microbrittleness) of the water pipe alloys as a result of three external factors action (exploitation time; friction and corrosion) have been studied. It was of interest to know which of these factors make the main alterations in the above-mentioned parameters. The various diameter (״(20-500) mm) water pipe of the commercial iron alloys, steel and zinc covered steel, as well the pieces of antique and modern pure iron served as the samples for investigation. pieces of antique iron (99,97 % purity) which was found during the archaeological works in the Middle Carpathian (Romania). water pipe specimens subjected to polishing until glistening at first by the diamond paste (with grain dimension ~10 µm) and then by the Cr2O3 powder (grain dimension ~ 2 µm. The corrosion influence was studied by the following way. First, the cross-sectional surface of the corroded water pipe samples were obtained to determine thickness and microstucture of stratum subjected to corrosion. 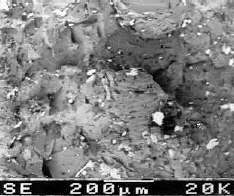 In our case the thickness of corroded layer was approximately ~(800-1000) µm. The outside part of stratum had an amorphous microstructure (~50-100 µm) (see figure 1); the layer with a grain-like or pillar-like microstructure is visible beneath it. Before testing the specimens were subjected to the fine polishing by the Cr2O3 powder to eliminate the amorphous layer of the corroded zone. 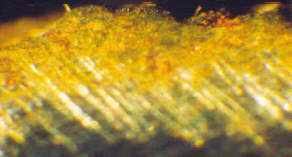 Fig 1: The cross-sectional surface of the corroded water pipe specimen. X75. Here d is the indentation diagonal, P is the load applied to the indenter. A method of acoustic emission (AE) signals was used to obtain the information about the material brittleness (2). The application of this method is based on the concept that the deformation and fracture processes are the sources of the acoustic signals bearing the profound information about the internal structure transformation. In the case of quasi-static indentation the acoustic emission signals were registered at indenter penetration into material (N1) and as a summary account of AE signals accumulated under loading/unloading process (SN).. The value N2 = S N- N1 indicates the AE signal sum appearing at the unloading stage. The investigations have shown that a long period of exploitation as well as a super-long period of aging of iron and its alloys don’t influence their hardness (see table below). Table 1: Microhardness as a function of the exploitation (aging) time. As it is shown in the table the microhardness of the different new Fe alloys samples varies in the limits of (1.65-1.4) GPa. The close value of microhardness (H=1.6 GPa) is also marked for specimens of the Zn-covered steel which was exploited during 26 years. The aging during 2000 years of the pure iron did not influence its hardness values, as well. A little lower value of antique Fe hardness (H=1.1 GPa) compared with modern Fe (H=1.2 GPa) may be connected with some variation of impurity content in samples or with the recrystallization processes in the antique specimen microstructure due to aging during two millenniums. It is known that a long-time rest of metals leads to their structure recrystallization and results in material softening (3). The scanning electron microscope photographs on figure 2 show the microstructure of antique and modern iron. Fig 2: The scanning electron microscope image of the microstructures of antique (a) and modern iron (b). Really, it is of interest to note that owing to recrystallization the grain dimensions of antique Fe are greater than those modern one. This fact can stipulate the facilitation of slippage at the plastic deformation process under indentation, that can respectively lead to the hardness diminution of antique Fe in comparison with modern one. Even so, the difference is so small that it is possible to consider the absence of aging influence on the hardness value. The results presented in the table above have been also confirmed by the study of specimen brittleness using method of the acoustic emission signal registration (see figure 3). Fig 3: Dependence of AE signals (N1) versus load for various samples: new water pipes (1, 2), antique Fe (3) and water pipe exploited 26 years (4). All the curves on figure 3 are practically coinciding. The AE curves (N1) are situated slightly higher than the noise level (Nn»100) at loads P<(1.5-1.7)N, and a small N1 growth is observed at P>1.7N . But these signals are probably produced by plastic deformation and not by brittle fracture. Really, as it was shown by microstructure investigation, the indentations made on the surface of both antique iron and modern Fe alloys have a plastic shape. The plastic flow of materials without any brittle fracture is seen over the indentation neighbourhood as well (see figure 4). Fig 4: The scanning electron microscope image of the indentations plotted on metal surface. P=2.0 N. a- general indentation pattern (x150); b- the surface relief in the pile-up region near the indentation (x500). The slight increase of the AE signals on the samples subjected to friction has been noted. The effect is better seen on the specimens which were subjected to coarse grinding by the diamond spar with the grain dimension of ~(20-30) µm (see figure 5). The short cracks were also observed near some indentations made with load P=2N by their microstructure studying. Hence, the formation of the rough surface promotes in the brittle failure under concentrated load action. Fig 5: Dependence of AE signals N1 (curves 1, 3) and N2 (curves 2, 4) versus load for fine polished (1,2) and subjected to coarse grinding (3,4) water pipes. The most noticeable increase of the AE signals was marked at the indentation of specimens suffered from the corrosion (see figure 6). The curve shape is practically the same for the non-corroded and corroded samples at small loads applied to the indenter. Fig 6: The curve shape of the AE signals account for the non-corroded (a) and corroded (b) specimens. The difference appears at the load P~1.0N. Here all the parameters N1, N2 and SN are approximately twice higher for the corroded specimen than for the non-corroded one. Likewise it is seen that the increase of the summary account of loading/unloading (SN) occurs because of the N2 increase. This denotes that brittle destruction takes place at the unloading stage, i.e. the brittle failure is a result of the material relaxation at indenter removal. 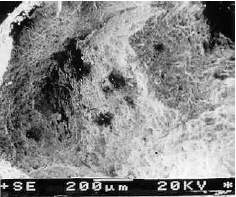 The reason for the increase of corroded specimen brittleness can be understood by examination of the microstructure of the corroded stratum (see figure 1). The corrosion processes result in damage of homogeneity, that is typical of non-corroded materials, and formation of a pillar-like microstructure and thereby creation of the condition for brittle fracture. The investigations of the influence of different external factors (exploitation or aging time; friction and corrosion actions) on the mechanical properties of the Fe alloys for water pipes have been performed using the microindentation and acoustic emission techniques. The obtained results showed no influence of long-time exploitation as well as aging on the hardness and brittleness of the specimens under investigation. The slight increase of the microhardness values and the AE signals sum has been noted on the samples subjected to friction. The effect was better seen on the specimens which were subjected to coarse grinding and to a lesser extent on the fine polished samples. The most effect is observed for the specimens subjected to corrosion. The regions suffered from the corrosion possess higher brittleness than non-corroded ones. We would like to thank Mr. B. Pushcash for the electron microscope investigations.